← Have you switched political party this year? Goldman Sachs has. Hurricane Sandy killed the Bounty two days ago, off the coast of North Carolina. It also killed crewmember Claudene Christian, a descendant of Fletcher Christian. The captain of the Bounty is missing, and that is unlikely to have a good outcome. This Bounty replica was built for Marlon Brando’s movie, “Mutiny on the Bounty” and wasn’t expected to have a long life. It was substantially larger than the original vessel, to make room for the movie cameras. 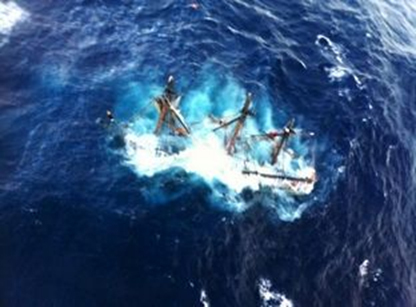 Fifty years later, this historic replica finally succumbed to the sea. The story of the actual Bounty’s expedition to Tahiti that occurred in 1789 is a tale of human relationships, of human characteristics at their basest and most noble. The truth of what happened has been blurred, reversed, adulterated and twisted by Hollywood movies. My novel, Higher Cause, certainly re-writes the story of the Bounty as well in the context of a modern day adventure to save the world. The final installments are being released by Laissez Faire Books over the next several weeks, and the entire ebook will be available to Laissez Faire Club member before the last few installments are published, at the end of November. The story of the Bounty will be part of the history of the world forever, and the tragic loss of the replica and some of its crew is another episode in its ongoing legacy. This entry was posted in Higher Cause and tagged Bounty, Claudine Christian, Fletcher Christian, Higher Cause, hurricane, Hurricane Sandy, John F. Hunt, John Hunt, Laissez Faire Books, Laissez Faire Club, mutiny, Petur Bjarnasson, Sandy, sink, sinking, Tahiti, tragedy. Bookmark the permalink.